Benchmark plans offered under the Better Care Reconciliation Act (BCRA) would nearly triple a Covered California enrollee’s deductible, from $2,500 per year to $7,350, with a deductible for a family increasing to more than $14,700. Reductions in subsidy levels would result in dramatic increases in coverage costs for lower-income and older Americans. SACRAMENTO— The National Academy of State Health Policy, in consultation with Covered California, released an analysis on Wednesday of the value of health coverage and subsidies across the nation that compares current law under the Patient Protection and Affordable Care Act and the Better Care Reconciliation Act (BCRA), which is under consideration in the U.S. Senate. The analysis, “Barely Covered: Initial Analysis of Coverage and Affordability Impacts to Consumers Under the Proposed Better Care Reconciliation Act,” is available at: http://nashp.org/wp-content/uploads/2017/06/Barely-Covered.pdf. The analysis looks at what consumers would need to spend to keep comparable coverage to what they have today, given the reduction in subsidies proposed in the BCRA. The analysis describes the coverage available on the individual market in California, Ohio and Pennsylvania. “While the Congressional Budget Office (CBO) analysis makes clear that 22 million Americans would lose coverage under the Senate’s proposal, this report puts a spotlight on the fact that for the millions of Americans who would remain insured, the skimpier benefits are coverage in name only,” said Peter V. Lee, executive director of Covered California. “Many consumers would face huge financial hurdles to get needed care. Under current law, health insurance products offered through Covered California are linked to a “benchmark” product with an actuarial value tied to a Silver-tier plan, which has a 70 percent actuarial value. Actuarial value is a measure of the expected health care costs a specific health plan will cover for a standard population. Higher actuarial value generally means lower cost sharing for enrollees. The Better Care Reconciliation Act (BCRA) sets the benchmark product at an actuarial value of 58 percent, which means the plan designs would need to have deductibles of $7,350 for an individual or $14,700 for a family — leaving consumers on the hook for huge out-of-pocket costs when they access care. Adds age as a premium contribution factor and increases the maximum contribution from 9.5 percent of income to more than 16 percent of income for individuals 59 and older. Reduces the ceiling for receiving subsidies from 400 percent to 350 percent of the federal poverty level — meaning that these consumers would bear the full cost of annual rate increases. Allows states to permit insurers to charge the oldest enrollees (age 64) five times what the youngest adult enrollees (age 21) are charged for their monthly premiums. Allows states to get waivers to the current essential health benefits, which the CBO estimates would mean that half of Americans would be living without the existing protections from lifetime limits or “gotcha” coverage gaps in states that exclude entire categories of care. The findings were contained in a study that Covered California sent with a letter to all 100 members of the United States Senate on Wednesday. You can see the letter here: http://hbex.coveredca.com/data-research/library/CoveredCA_Senate_Ltr_re_NASHP_Analysis_6.28.17.pdf. 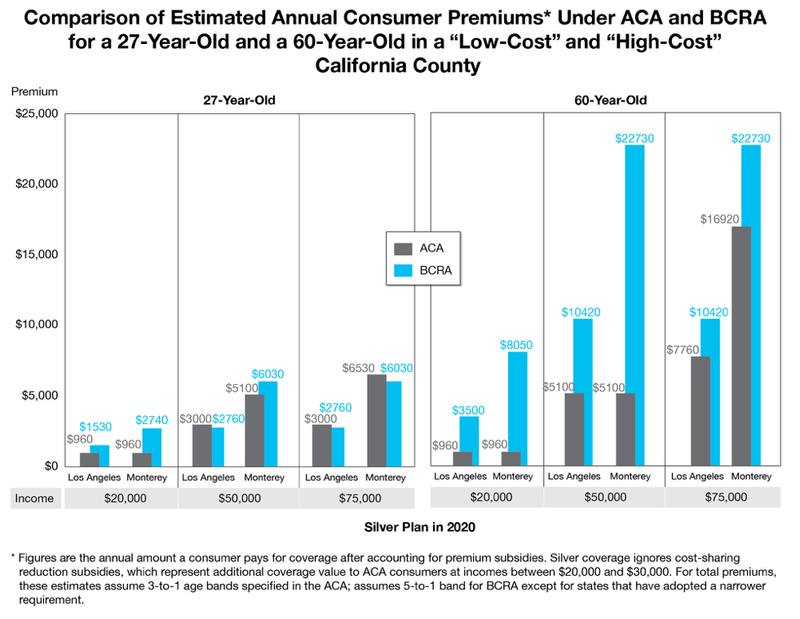 “Barely Covered: Initial Analysis of Coverage and Affordability Impacts to Consumers Under the Proposed Better Care Reconciliation Act” also compares the subsidies provided under the BCRA to those available under current law to purchase Silver-tier health plans, the most commonly selected coverage level currently available. The study provides estimates of costs for individuals of different ages and income levels, assessing what their costs would be if they live in lower-cost or higher-cost regions of each state. The study uses Kaiser Family Foundation data and shows that the BCRA tax credit structure would modestly lower “net premiums” — what consumers pay after receiving a subsidy — for some younger enrollees in lower cost regions. However, many consumers, especially those who are lower-income and older and live in higher-cost regions, would see dramatically higher net premiums under the BCRA due to the tax credit changes. The following chart shows the difference in premium costs for a Silver plan under the Affordable Care Act and the BCRA for a 27-year-old and a 60-year-old in Los Angeles County (a relatively low-cost county) and Monterey County (a high-cost county). Further, the shift toward lower-actuarial-value plans and the loss of cost-sharing reduction subsidies would mean low-income consumers would likely struggle to pay the significant out-of-pocket costs for health care services when they need them, even if they are able to afford the monthly premiums. This could result in either consumers declining to seek care at all, or being unable to pay for services after they have been received. Information on Covered California’s patient-centered benefit designs is available here: https://www.coveredca.com/PDFs/2017-Health-Benefits-table.pdf. Palo Cedro Park to hold annual Spring Community Clean-Up Day—Volunteers NEEDED! !